It takes more than a truck to get Gallo wines to market. It takes marketing too, which is Stephanie Gallo's specialty. On a mid-September Wednesday, it's nearly harvest time at the E&J Gallo Winery in Northern California. As Stephanie Gallo '99, the company's marketing director, enumerates the benefits of managing a family business, a peculiar cacophony rises in the background. She ignores it. Not having investors to impress makes it easier to switch strategies quickly if the consumer demands something new, she says. In fact, in the last 10 years alone, the winery has introduced more than 30 brands in response to consumer feedback. The background noise doesn't let up. What is that sound? Gallo explains: It's the peacocks. "My grandfather [Ernest] loved interesting and eclectic things," she says. Years ago, he was raising roosters at his home and thought a few peacocks would add character to the yard. Gallo says the colorful birds turned out to be significantly less tidy than the roosters, and eventually her grandmother banished them from the grounds. They've lived on the winery campus ever since. Given the history of the winery — founded by Ernest and brother Julio during Prohibition — it's no surprise that Gallo's grandfather had unconventional tastes. "I don't know how they did it," says Gallo. "They were 23 and 24, respectively. They had no money and no experience in commercial winemaking." What they did have, she adds, was the strong work ethic and determination of men who literally could not afford to fail. They also had a couple of pre-Prohibition pamphlets containing instructions for how to make wine. It wasn't much, but it was enough. 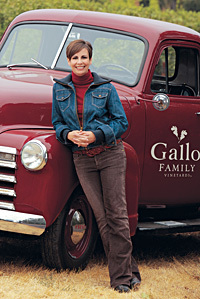 Gallo says the winery's respect for the natural world was also passed down from its founders. As the company grew, Julio set aside an acre of local land for preservation for every acre planted in the vineyard. The winery also supports sustainable growing practices in interesting ways. Rather than relying on toxic chemicals or noise pollution to discourage crows from feasting on vineyard grapes, the company employs a falconer to keep the birds in check. Gallo always knew she wanted to be a part of the winery. "Growing up in a family business, you're exposed to the business from a very early age," she says, reflecting on childhood memories of wine at the dinner table and her father and grandfather asking the younger generation's opinions on wine, packaging and other business decisions. "I knew as an undergrad that I wanted to get into marketing because I'd done a couple of internships at the winery." After college, Gallo secured her first official position at the winery — in sales. "It's not the most glamorous job," she says. "You start early. You end late." Following a few years in the sales trenches, she enrolled at Kellogg to study marketing. Gallo, who spoke at the Kellogg Women's Leadership Workshop in February, says that women "have played an important role" in designing the winery's current success, but she hastens to add that a manager's skill will always trump gender. "At the end of the day, you have to let the results speak for themselves," she says. "Results are the great equalizer." Kellogg has been a valuable source of talent for the winery. Gallo says there are more than a dozen Kellogg alumni working at the company. "The Kellogg culture and the Gallo culture are very similar," she adds, noting that each thrives under the care of smart, passionate people who work together to rally customers and co-workers. "It's the culture that really matters."